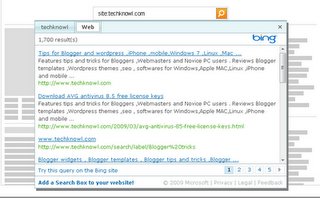 Microsoft recently launched Bing search engine by renaming their two year old Live search. Bing is getting a mixed reaction from both public and geeks. I have already shared my experience on Bing, which is still worse in some aspects. However, it seems that Microsoft is putting the lot of efforts to bring a Google look alike in Bing. Bing now shows news results and indexes pages almost instantly. There is also an improvement in search speed. Another surprise is the traffic it brings. Recently, I have seen sudden depletion in my incoming search engine traffic from Yahoo and a rise from Bing side. So I was forced to sign up and Submit websites to Bing webmaster center, which earlier I ignored. Here I will share how you can sign up with Bing Webmaster center, submit a website /sitemap and to add Bing search box. Bing search results are just like that was in Live search. So at this point they are not a competitor for Google. However, public interest would increase due to their million dollar advertisement tactics, and if they are successful at maintaining the current buzz in tech blogs and around geek community. So if you are a webmaster, you can take advantage of Bing traffic by submitting a website /blog to the webmaster account and verifying sitemap. We have already discussed the benefits of submitting a sitemap while discussing about Google sitemap for Blogger. Submit a website /blog to Bing search here. The above one is just a basic submission If you want to add sitemap and collect more details, you may consider creating a Bing webmaster account . Go to Bing webmaster and sign into tools with your Windows Live /Hotmail/MSN account . Now click on add a website >insert you website URL and sitemap location and submit. Blogger users can submit their atom feed (www.blog.com/atom.xml) as sitemap . Verification is necessary to confirm ownership of the website – to use more features and analytics. The above submission directs to Authentication page . Choose Meta tag authentication, then copy and paste the meta tag under to the head section of the target website . Return to the site list and click on the verified site link . Now you will see the detailed information of the website, its Bing score, backlinks and indexed pages. 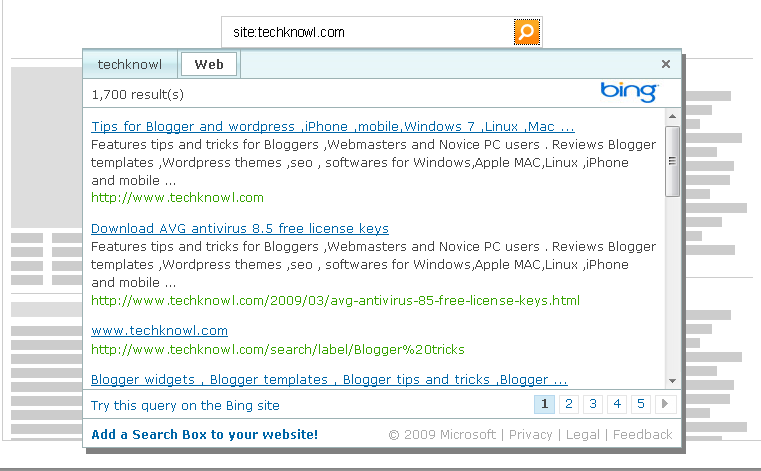 Love Bing search?You can add a Bing search box to your website /blog to show your support. Here is how you can do that. Go to this web page intended for site owners. There are two options, one to create a basic search box and other an advanced one. The second Bing Box is more customizable. In that, you can opt to include your website to be included in search results. It will pop-out within the website as shown below .